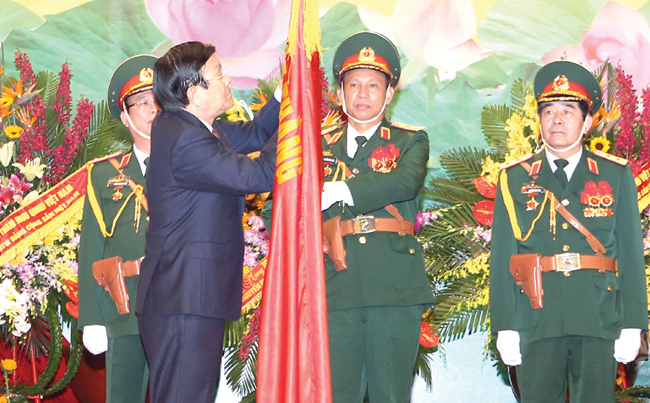 HA NOI (VNS) — The General Staff of the Viet Nam People's Army was awarded the Military Exploit Order yesterday at a ceremony in Hanoi marking the 70th anniversary of the founding of the General Staff on September 7th 1945. Dignitaries present at the meeting included President Truong Tan Sang, former Party General Secretary Le Kha Phieu, former State President Tran Duc Luong and many other high ranking party and government officials. In his speech, Do Ba Ty, Senior Lieutenant General – Chief of the General Staff and Deputy Minister of Defence said over the last 70 years, the General Staff had proven it deserved to be the strategic body of the Party Central Committee, the Government and the State. "Factors leading to our final victory in the American war include the art of the people's war, where civilians took up arms and the clever tactics of the People's Armed Forces with direct instructions from the General Staff," Ty said. President Truong Tan Sang extolled the achievements and development of the General Staff in the past 70 years. Sang said "building the nation must always go hand in hand with national defence" – it is needed for the existence and development of the Vietnamese nation for thousands of years. "At present, nation building and defence are the two most important tasks for the Vietnamese nation," he emphasised. He said the task of defending the homeland was important for the Party and the entire nation, particularly for the people's armed forces; with a lot of responsibility falling on the General Staff of the Viet Nam People's Army. He asked the General Staff to give timely advice to the Central Military Commission and the Ministry of National Defence so that the Viet Nam People's Army can fulfill their tasks.